This is an invited translation and authorized publication of both text and pictures. All rights reserved. Life is limited, so life is all about to transcend time, and to resist the passage of time. We have comprehended this point in Heidegger’s philosophy. Therefore, as an existence, painting expresses ideas and emotions. It is meant to solidify the time in order to transcend time. Externalization of emotion is mental transcendence of flesh, and expression of idea is transcendence of spiritual world beyond material world. Both have to be accomplished through solidify the time. This relies on its material: canvas, paint, ink, or rice paper, etc. Transcendence of the material is achieved by reorganization of the substance. Eternity of material is the eternity of art. Immortal material, immortal art. From this perspective, oil painting is better than ink painting; porcelain painting is better than oil painting. Epitaph, which engraves name on stone, represents our longing for eternity – like the stone. Chinese seal carving also engraves name on stone, except that the stone is more elegant and more beautiful with a good moral meaning in it. The motivation of porcelain painting is the same. The creation of art replaces the artist himself. Eternity of the artwork is the eternity of the author. Porcelain is harder than paper, cloth, or jade, and lasts longer. It is man-made, brought back to nature, and reunited as part of the nature with expectation to exist forever, like heaven and earth. From Heidegger’s perspective, this is to achieve self-transcendence of time by artistic means. Porcelain has its unique, highly cultural texture. As to outward appearance, copper and iron are hard, cold, antique, heavy, solid and solemn, which basically is the natural expression of their natural properties. In contrast, porcelain, which looks hard, noble, elegant, with spirituality, barely presents any natural attributes. Copper and iron are purified from ore – a natural mixture, thus still maintain their natural properties; porcelain, however, is re-created from natural objects. Porcelain is made from earth. Once fired, porcelain loses its natural properties, therefore it belongs to humanity. Compared to metal, porcelain is much more cultural. “A room without porcelain is not elegant”. This is a well-known Chinese proverb. How is it elegant? It is because porcelain art is poetry. The porcelain surface is gorgeous and luxuriant, just like poem. It presents paintings at its surface, which implements the “picturesque” aesthetic realm. 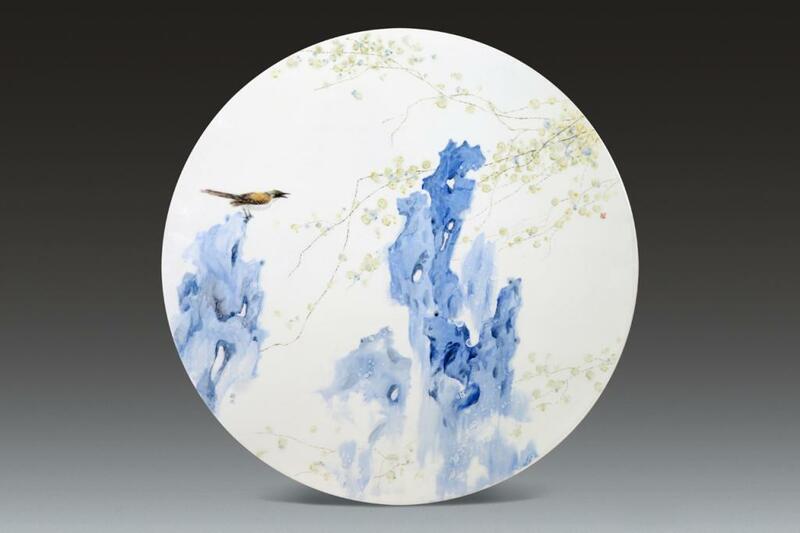 We can grasp the artistic concept of poetry within porcelain’s color and luster. It is like music, with a sense of melody; it is like poems’ rhymes, which are rhythmed. Comprehending porcelain beauty leads to understanding the beauty of poetry, and vice versa. Shape has become to exist as a special language and unique expression of porcelain art. Together with material, decorative pattern and painting, it formed the artistic composition of porcelain art. No shape, no porcelain art: because shape is solidified emotional state, and shape is a unique aesthetic expression in three-dimensional way. It has its posture, it has its language, and it occupies the space to display its beauty, the beauty of the shape. If we say dance forms its shape with movements, then porcelain art shows movements through its shape. Collingwood said: Dance is the mother of language. Dance is motion, motion is posture, and it is posture that speaks to us. The layer of glaze on porcelain is highly cultural. “The reality of a thing is the work of thing itself, while the appearance of a thing is the work of human.” (Schiller: “Aesthetic Letters” P133) Schiller said: “The essence of art is appearance.” (Schiller: “Aesthetic Letters P134) People no longer feel happy merely for a thing itself, but for a thing he creates. One reaches aesthetic reality from general (natural) reality and achieves aesthetic from simple natural life. This is proof of an external freedom: that he has achieved transcendence beyond himself through the transcendence of nature. This is also proof of an inner freedom: he has the power of imagination and creativity. Then we can appreciate the freedom that artists achieve through aesthetic. The viewer achieves aesthetic through the aesthetics and emotions the works exhibit, so the viewer also reaches freedom. This is the inspiration that porcelain art brings the world. Color: The color which porcelain gains after firing is more beautiful than natural color. It has a texture of light. Regular paintings are colorful, while the color of porcelain art is even brighter than regular painting pigment. Compared to regular painting pigment, it has richer various levels and broader gradations. 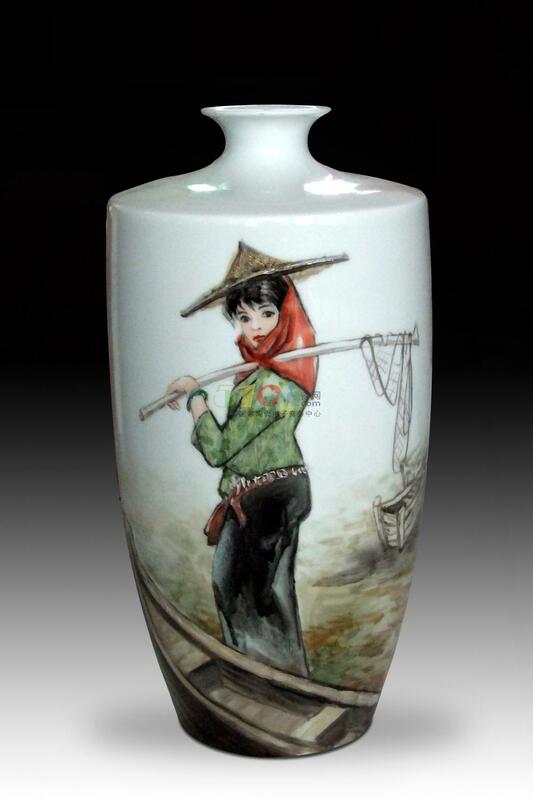 Color is one of the reasons why painting of porcelain art is more expressive. Space: Regular painting is to reproduce three-dimensional objects on a two-dimensional plane. 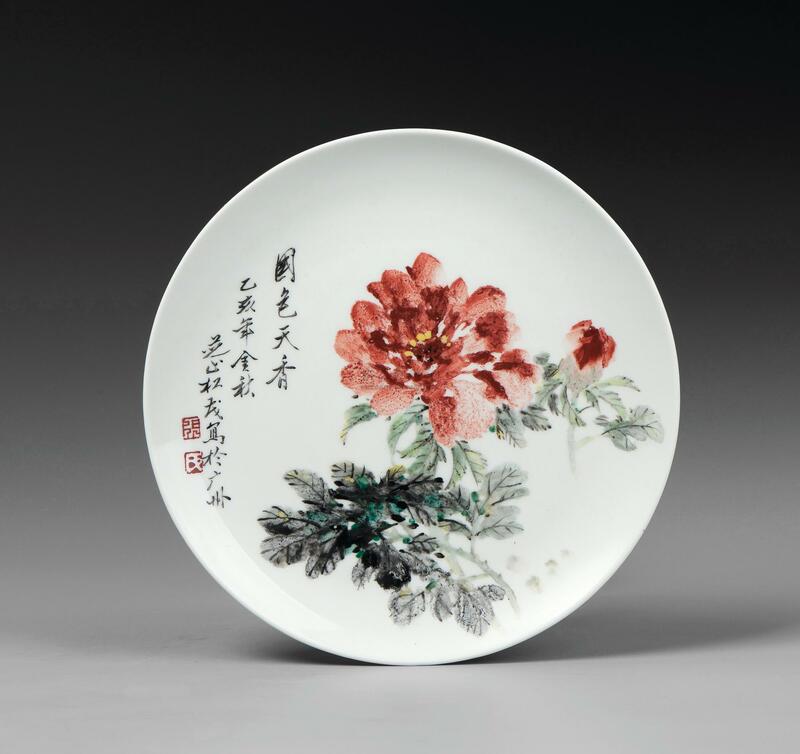 Porcelain art painting, compared to regular painting, has certain technical difficulty, because it is to reproduce visual objects on the surface of a three-dimensional space. To paint a triangle on a plane, all sides of the triangle will have equal length. However, as to triangle on a porcelain object, the lengths of all sides are unequal. This is Einstein’s concept of curved space. Porcelain artist paints on a curved surface. He needs to reproduce images on the surface of curved space. In the mean time, he needs to conform to human visual habits. Completeness: In regular plane painting, the world is an “isolated” world. Its four sides are its boundaries, and what’s behind it is always unknown. Thus painting, in fact, exists isolated from the rest of the world. We will also feel in our visual impression that regular plane painting is out of tune with its surrounding world. It is an isolated presence and therefore it can only talk with the visual, but cannot be integrated into the world. It is because it is formed by illusion, so that, no illusion, no painting. Thus, it is formed in a visual, so it will also fades away in the visual. Its existence relies on the visual, thus it is a dependent existence: no visual, no painting. This is to say, it is not an object of self-existence. However, porcelain art is not the case. Porcelain is complete by itself, it communicates with the world as a complete existence. It is of self-existence. Whether visual pays attention to it, it exists. Since porcelain painting is drawn on the surface of an object, it thus obtained a life by borrowing the reality of the object. Painting on porcelain surface spans end-to-end, 360 degrees, forming a complete world. Hence it is not isolated from the rest of the world. Its complete self talks with the complete world. It fuses together with its shape. The expression of shape becomes the expression of painting. Therefore, compared to regular painting, it is more fluidic and more three-dimensional, more vivid, more perfect, with more vitality. This is a class of three-dimensional visual effects that regular painting does not have. 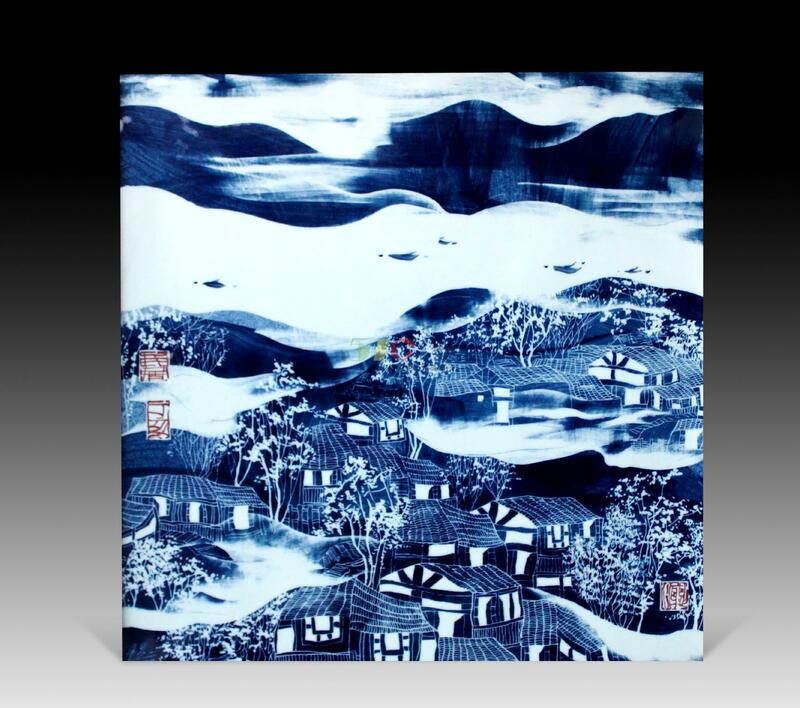 Porcelain slate painting: Visual believes that the world it sees is the complete world. Rationality proves it, thus oil painting needs to paint the entire canvas. Then, color, perspective, lighting and shading are expressed. But the whole composition ignores its carrier – canvas or drawing board. 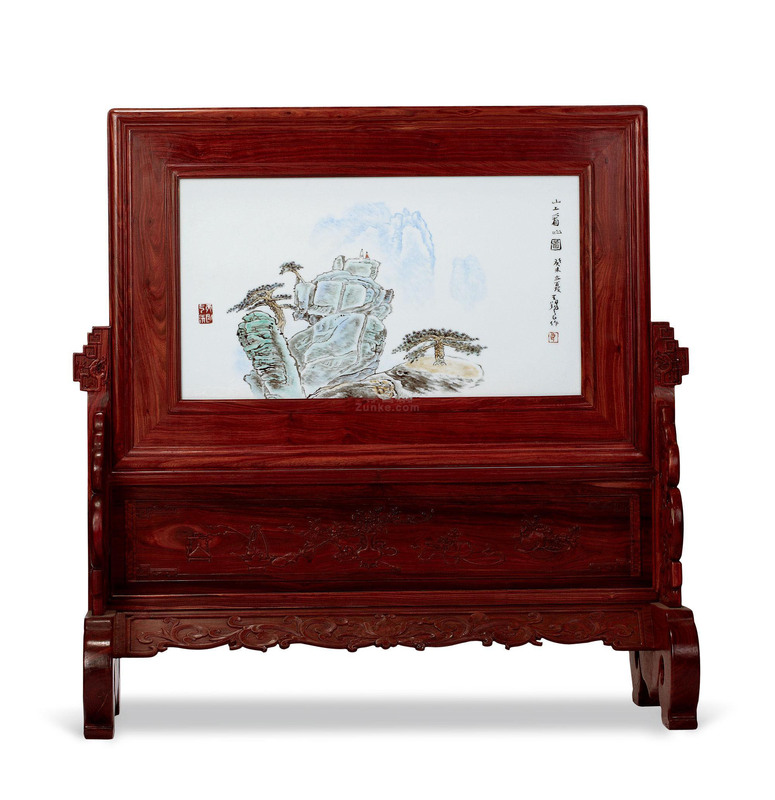 Chinese painting pigment creates artwork together with its carrier (rice paper or silk cloth). Black is “being” and white is “null”. This is much in line with the view of the world, the “yin and yang” in ancient Chinese philosophy. 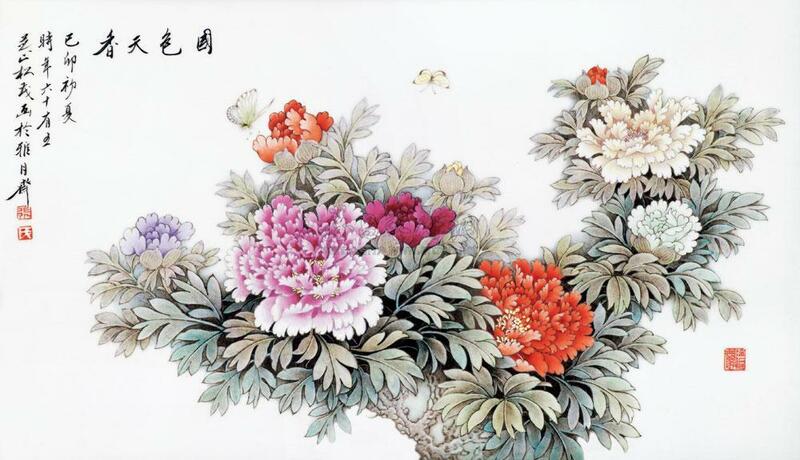 On Chinese painting, the world is not fully painted. It is not a visual belief but a conceptual belief. Black and white can represent anything. Thus, oil paintings depict the visual world, while black and white elaborates the world of ideas. In Chinese painting, “white”, aka “blank”, is “vacancy” or “incomplete”. “Black” represents “fullness”, so it has blocks of color, it has halo of staining. Black represents all the colors; one color is multiple colors. Black and white represents the variations between all colors. Lighting and shading plays a key role in oil painting; the relationship between lighting and shading is the relationship between things in the world, it is a confrontation. In Chinese painting, black and white, yin and yang, also express relationship between things, it is a struggle. Confrontation and struggle, however, are merely nature’s expressions; the struggle is neither the destination of philosophy, nor the end of world. Civilization eventually will transcend the nature, will reach the beauty of order and harmony. 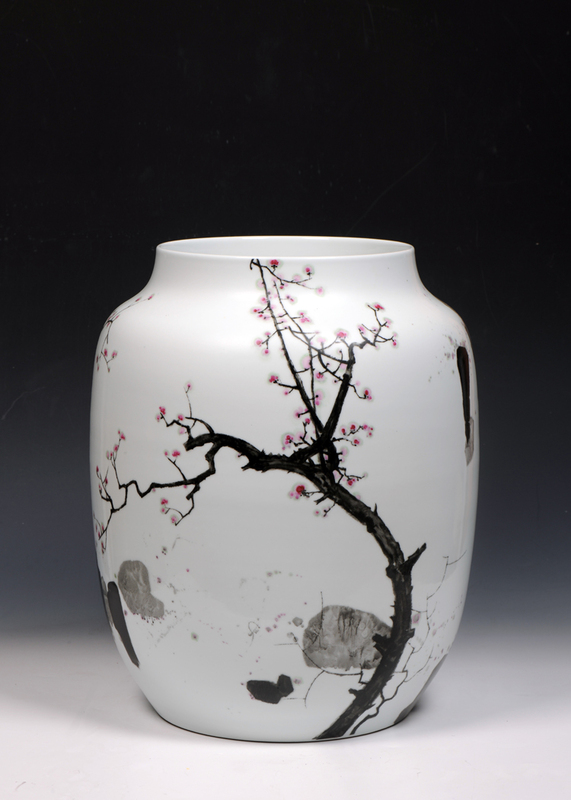 This ideal of order and harmony is expressed in porcelain art. This is the role of “porcelain color” in artistic expression. A very beautiful lesson in porcelain art. Thank you.